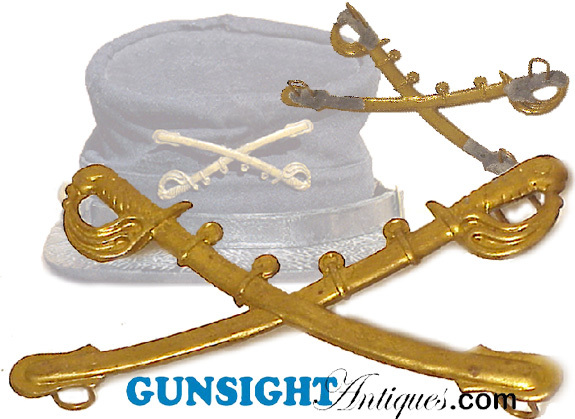 Original 1872 enlisted Cavalry hat device. Die struck with four soldered on attachment loops, this Indian War version of the Civil War vintage cavalry device is a bit smaller than it’s predecessor measuring approximately 2 ¾" across. Regulation wear was to be on the front of the forage cap rather than on the crown as was the case in the Civil War. We have acquired a very limited number of these from decades of storage and are offering them here at a reasonable price for the Indian Wars and Cavalry collector who would enjoy an original or the Civil War enthusiast who would like a representative piece for wear or display without laying out the more hefty sum of the earlier model. please note: ALL ITEMS ARE CURRENT & AVAILABLE UNLESS MARKED SOLD!!. 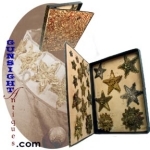 If you are new to Gunsight Antiques and wish additional information or just to learn who we are, please check out our home page. Thanks for visiting Gunsight Antiques ! !